Once you’ve set up a workflow, learn how to edit and manage workflow details. Change the status of your workflow to inactive or archive workflows you no longer need. Once a workflow is active and taking action, learn what details can be changed. Go to the Saved Workflows tab, then select the name of the workflow you'd like to edit. On the workflow’s Details tab, you can review and edit details. Once you've made updates to your workflow, select Save to keep your changes. Workflow Name You can always edit the workflow name. Trigger Type & Trigger When Before a workflow is active, you can change the trigger type and when details. After a workflow has been activated, trigger type and trigger when details can't be changed. And Meet Criteria Edit criteria at any time. After saving, your workflow will trigger based on your updated criteria. Keep in mind, changing the criteria on an Active workflow may remove records that have already triggered the workflow. Allow this event to recur yearly You can always edit if you want to allow the workflow to recur yearly (when applicable to a trigger type). You can add, update, or delete workflow actions. When a workflow has performed actions, some things can't be changed and we'll cover that in detail below. 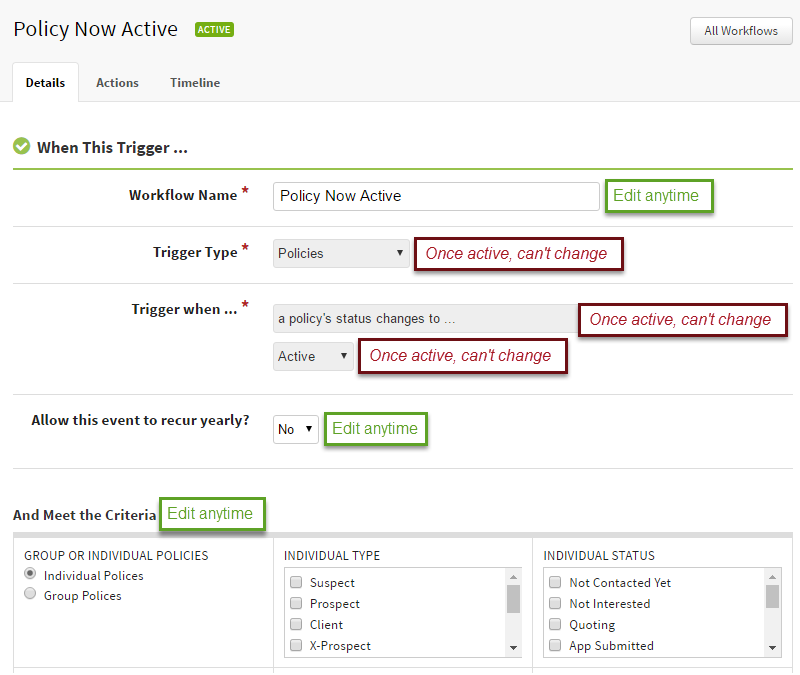 Go to a workflow’s Actions tab and Select New Action. Select the action type you want to add and fill in the details of your action. Select Save Action. The new action will save and will be active. When the workflow has not advanced past the timing of the new action. You can edit existing actions by clicking on the name of the action in the workflow Actions tab. Clicking on the name of the action will direct you to the Action’s detail where you can edit action details. After you have updated your action, click Save Action to commit your changes. There are a few details that you can't edit once an action has been sent to its first recipient or assigned to its first follow-up user. Action Changing the type of the action. 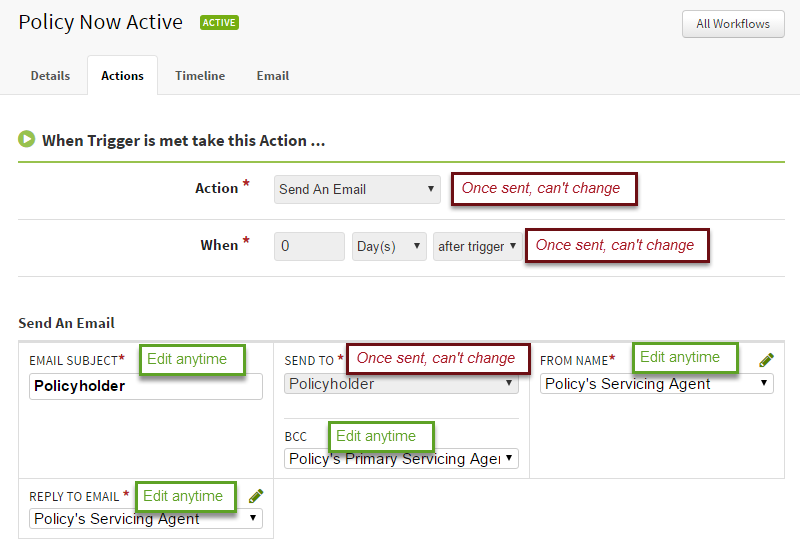 For example, changing an action from an email to an activity. When Changing when an action occurs. Send to For an email, the Send To field can't be edited after the first email has been sent. You can delete actions if it has not been sent to its first recipient or assigned to its first follow-up user. To delete an action, click on the name of the action in the workflow’s Actions tab and select 'Delete Action' at the bottom of the screen. Actions can have a status of active or inactive. By default, actions in a workflow are active. You can inactivate actions that are no longer needed. To inactivate an action, select the name of the action from the workflow’s Actions tab and select 'Inactivate Action' button at the bottom of the screen. Draft - When you are working on setting up the workflow and haven't activated it yet. Active - Once active, your workflows run in the background and watches for triggers to start workflows and perform actions. Inactive - When you need to pause or turn off a workflow, set it to inactive. Archived - A workflow is no longer needed and is stored for historical purposes. Disabled - Your workflow has been disabled due to a spam or bounce rate being too high. Go to the Saved Workflow tab, then select the workflow you'd like to inactivate. From the workflow Details tab, scroll down to below the criteria section of the workflow. Select Inactivate to pause the workflow. Go to the Saved Workflow tab, then select the workflow you'd like to archive. Select archive to archive the workflow. You can activate inactive or archived workflows at any time. Keep in mind, when you activate the workflow, it will perform any actions previously triggered and scheduled before the workflow was in an inactive or archived status. Are archived workflows automatically set as inactive, meaning they don't run? Yep, archived workflows are automatically set as inactive and do not trigger or take actions.